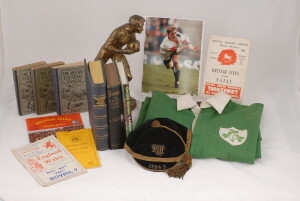 Are you interested in selling sports memorabilia, including old cricket books, golf books, football and rugby books? You may have built up a special collection over many years and have now decided to diversify in some way. You may have just discovered a great uncle’s amazing collection of rugby programmes or tennis books languishing in an attic. We are always interested in anyone selling sports memorabilia and we are always keen to buy good quality sports books and memorabilia. We pay top prices for the right sort of material, but the condition needs to be good and the item of a significant rarity to obtain these prices. While we are keen to offer a good price for any item, all vendors should be aware that we do, of course, buy to re-sell at a profit. Do not be afraid to approach us if you are only looking to sell sports books and sports memorabilia in small quantities or number. We buy any amount of sports books and related material from the largest libraries or collections to the tiniest, single pamphlet. Quality is the key ingredient for us: the rarity of the items; their condition and whether they fill a key gap in our extensive stock. There are a great many books that we don’t want – that we already have or hold little re-sale value for us – so please do not be offended if we decline to make any sort of offer. In these cases, we are always happy to suggest others ways and channels that you may want to look at for selling sports memorabilia. 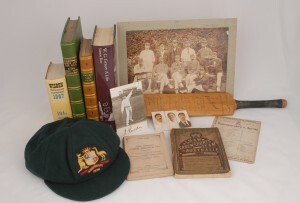 concerning provenance and condition that you can supply, the better able we are to give you a pinpoint valuation.